High myopia, one of the most prevalent eye diseases worldwide, has a higher risk of occurrence than other eye diseases. High myopia is associated with the elongation of axial length (AL).,, Studies have shown that the incidence and progression of cataract among those with high myopia were significantly higher and faster than those with nonmyopic eyes., At present, patients with high myopia and cataract were often treated with cataract phacoemulsification. Cataract surgery mainly consists of three steps: preoperative preparation, operation and postoperative symptomatic treatment, and observation and follow-up. In the recent years, as a treatment of eye diseases, the development of cataract surgery was applied to improve preoperative vision correction, and such an application demands a higher standard for all aspects of cataract surgery. The IOL power calculation formula has been applied for more than 40 years clinically and has been developed to the fourth-generation formula., At present, the most commonly used IOL power calculation formula are the second- and third-generation formulas. 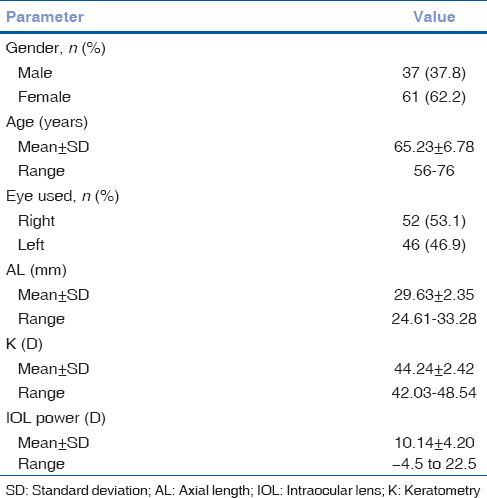 Although scholars have been studying the comparison of IOL power calculation formulas for many years, research has rarely probed into the accuracy and application conditions of various formulas.,, Studies have proposed that 54% deviation between actual diopter and prediction of diopter after cataract surgery comes from AL measurement, whereas 38% predicted from postoperative anterior chamber depth (ACD) and another 8% came from the evaluation of corneal curvature. Therefore, the accuracy of preoperative eye AL measurement is of particular importance. This study was performed to evaluate and compare the accuracy of the refractive prediction determined by different intraocular lens (IOL) power calculation formulas for high myopia and to analyze the correlation among the mean absolute error (MAE) rendered by different formulas and AL. Thus, this study provided reference for surgical treatment of patients with high myopia. Details about all the patients who had received cataract extraction and IOL implantation were collected from our hospital from July 2016 to December 2017, based on the following criteria to eliminate bias. The inclusion criteria were as follows: (1) patients who had high myopia combined with cataract and had completed preoperative examination data and postoperative follow-up; (2) those who underwent cataract surgery performed by phacoemulsification and had no complications; (3) computing tool use of AcrySof IOL; and (4) preoperative biological measurement using LENSTAR LS900 (Haag-Streit AG, Koeniz, Switzerland). The exclusion criteria were as follows: (1) patients with a history of previous intraocular surgery or those who had postoperative complications; (2) patients followed up less than 1 month; and (3) preexisting ocular diseases that may affect postoperative refraction, for instance, keratoconus, endothelial dystrophy, corneal scarring, macular edema or retinal detachment. Before the operation, LENSTAR LS900 measuring instrument and contact-type A ultrasound were used to measure the AL, corneal curvature, and other related eye parameters of recruited patients, and the measurement was repeated five times to obtain the average figure. Meanwhile, slit lamp microscope examination, computer optometry, and pupil fundus examination were conducted. Patients were distributed into group 1 (24.5 mm ≤ AL <27 mm, n = 28), group 2 (27.0 mm ≤ AL < 30 mm, n = 47), and group 3 (AL ≥30 mm, n = 23) in terms of their ALs. After the operation, the number of diopter was measured, and the best-corrected visual acuity refractive state was determined by standard methods at least 1 month after surgery by the same professional automatic computer optometry instrument, namely, postoperative actual diopter. The MAE was calculated after operation. The four formulas of SRK/T, Haigis, Holladay, and Hoffer Q were selected from LENSTAR LS900 optical biosensor. According to the recommended LENSTAR LS900 optical biological measuring instrument, SRK/T formula optimization of A constant is 121.00, A0 Haigis formula optimization constant is 3.151, A1 constant is 0.400, A2 constant is 0.100, Holladay formula optimization of SF constant is 2.92, and Hoffer Q formula optimization pACD constant is 6.72. Meanwhile, back-calculation with new-generation Barrett Universal II formula was performed using the online software (http://www.apacrs.org/barrett universal2/), and the constants recommended in this online software were used for back-calculation. Normally, patients with high myopia would reserve the target refraction of 0.75D–3.0D. The selected AcrySof IOL degrees are respectively substituted into SRK/T formula, Haigis formula, Holladay formula, Hoffer Q formula, and Barrett Universal II formula. The absolute refractive error was calculated in terms of the difference among the predicted refraction outcomes and the actual postoperative refractive (actual postoperative refraction − predicted refraction) rendered by each formula. The mean absolute refractive error was calculated by each formula. The refractive error absolute value (by percentage) of each formula was calculated at ±0.25D, ± 0.50D, ±1.00D, and ±2.00D. SPSS (version 22.00; SPSS, Inc., IL, USA) was used for statistical analysis. Means were shown as mean ± standard deviation (SD). The MAE of SRK/T, Haigis, Holladay, Hoffer Q, and Barrett Universal II formula was compared among all patients with high myopia. 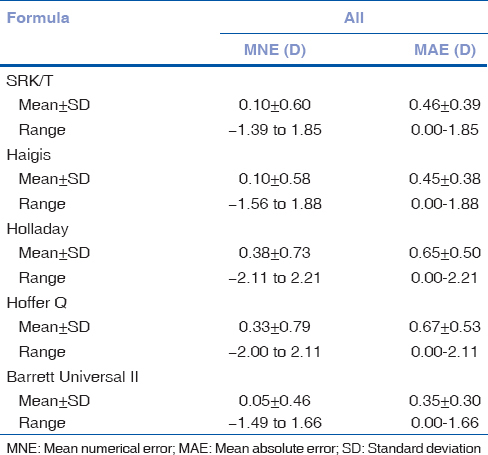 The differences in the mean numerical error (MNE) and MAE rendered by the five formulas – SRK/T, Haigis, Holladay, Hoffer Q, and Barrett Universal II at different ALs, were calculated using single-factor variance analysis. The least significant difference was used in two or two comparisons, and the association between MAE and AL was assessed using Spearman's rank correlation. P values less than 0.05 were considered as statistically significant. This study selected 217 eyes of 135 patients who had received cataract aspiration and IOL implantation. In all, 98 eyes of 98 patients were eventually investigated in this study. Patient's basic information, mean values, and ranges measured by IOLMaster were as follows: 37 males (37.8%), 61 females (62.2%), age 65.23 ± 6.78 years (range 56.0–76.0 years), 52 right eyes (53.1%), 46 left eyes (46.9%), ALs were 29.63 ± 2.35 mm (range 24.61–33.28 mm), average keratometries were 44.24D ± 2.42D (range 42.03D–48.54D), and IOL powers were 10.14D ± 4.20D (range − 4.5D to − 22.5D) [Table 1]. We found that among all the eyes, the MNE values ranged from 0.05 to 0.38 [Table 2], and that all formulas had a positive MNE and yielded a considerably high interquartile range (IQR) [Table 2]. Barrett Universal II formula had the lowest MNE and IQR in the five formulas, whereas SRK/T and Haigis formulas had similar MNEs; however, the MNE of Holladay and Hoffer Q was the highest [Table 2]. In group 1, we calculated that the MNE ranged from 0.06 to 0.45, whereas the SD ranged from 0.33 to 0.56, and that SRK/T formula had the lowest MNE among all the formulas, whereas Barrett Universal II formula reached the smallest SD [Table 3]. However, in group 2, we identified that the MNE ranged from 0.04 to 0.36, whereas the SD ranged from 0.32 to 0.77. SRK/T formula had the lowest MNE among all the formulas; however, Barrett Universal II formula touched the smallest SD [Table 3]. In group 3, the MNE ranged from − 0.15 to 0.60, and the SD ranged from 0.64 to 1.04. Barrett Universal II formula had the lowest MNE among all formulas; however, Haigis formula had the smallest SD [Table 3]. The MAE values ranged from 0.35 to 0.67 [Table 2] among all the eyes examined. All the formulas had a positive MAE and similar IQRs [Table 2]. We found that Barrett Universal II formula had the lowest MAE and IQR among the five formulas, and that SRK/T and Haigis formulas had similar MAEs, and that the MAEs of Holladay and Hoffer Q were the highest [Table 2]. 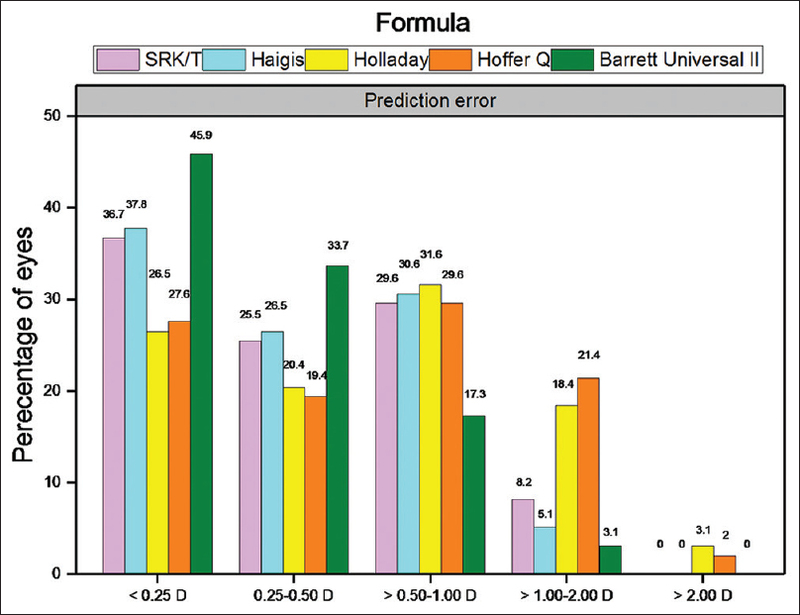 In formula subgroup in which refractive error absolute value was less than 0.5D, Barrett Universal II formula had the highest proportion, SRK/T and Haigis formulas had similar proportion, and the proportion of Holladay and Hoffer Q was the lowest. In formula subgroup in which refractive error absolute value was more than 0.5D, Barrett Universal II formula had the lowest proportion of value outcome reaching higher than 0.5D, SRK/T and Haigis formulas had similar proportion, and the proportions of Holladay and Hoffer Q were the highest [Figure 1]. In group 1, the MAE ranged from 0.27 to 0.55, and the SD ranged from 0.19 to 0.47. The results showed that Barrett Universal II formula had the lowest MAE and IQR among all the formulas [Table 3]. In addition, we found that the proportion of Barrett Universal II formula was the highest when the refractive error absolute value was less than 0.5D, and that Barrett Universal II formula was the lowest when refractive error absolute value was more than 0.5D [Figure 2]. In group 2, the MAE ranged from 0.29 to 0.64, whereas the SD ranged from 0.21 to 0.49. Barrett Universal II formula had the lowest MAE and IQR among all the formulas [Table 3]. Furthermore, the results indicated that the proportion of Barrett Universal II formula was the highest when the refractive error absolute value was less than 0.5 D, and that Barrett Universal II formula was the lowest when the refractive error absolute value was more than 0.5D [Figure 2]. In group 3, the MAE ranged from 0.55 to 1.00, and the SD ranged from 0.41 to 0.62. Barrett Universal II formula had the lowest MAE among all formulas; however, Haigis formula has the smallest SD [Table 3]. Furthermore, the proportions of Barrett Universal II formula and Haigis were similar when the refractive error absolute value was less than 0.5D, and obviously higher than other formulas [Figure 2]. The correlation analysis showed that the prediction error of each formula was positively correlated with AL [Figure 3]. In this study, we compared the accuracies of four widely used IOL power calculation formulas, namely, Holladay, SRK/T, Hoffer Q, and Haigis as well as a new-generation formula, that is, Barrett Universal II, applying for 98 high myopic eyes. The significance of this study is to reduce the prediction error of diopter, which greatly affects patients' prognosis. In addition, this is one of the few studies supportive of the fact that the use of Barrett Universal II formula would enhance predictability in high myopia. The cataract aspiration in combination with IOL implantation is the main method to treat cataract with high myopia. In recent years, two main challenges in IOL power prediction for high myopia have emerged, that is, on one hand, there exists unexpected hyperopic outcomes with IOL power prediction formulas regardless of the IOL power (though this tendency for postoperative hyperopic outcomes is more marked for eyes with minus-power IOL), and on the other hand, the error rate of formula prediction increases gradually as the AL grows., To avoid these postoperative hyperopic outcomes and improve patient satisfaction, surgeons usually empirically reserved − 0.75 D to − 3 D diopter for patients with high myopia. The most important factors that explain the prediction error in IOL calculations are the effective lens position assumption and the IOL constant adopted., In this study, the formula constants were optimized, and the prediction results show that Barrett Universal II formula has the highest proportion of outcomes of refractive error absolute value being lower than 0.5D, SRK/T and Haigis formulas had similar proportion to Barrett Universal II formula, and the proportion of Holladay and Hoffer Q formula was the lowest among the three formulas. Meanwhile, Barrett Universal II formula has the lowest proportion, SRK/T and Haigis formulas had similar proportion, and the proportions of Holladay and Hoffer Q were the highest formula when the refractive error absolute value was more than 0.5D, indicating that Barrett Universal II formula has higher accuracy in the refractive prediction of patients with high myopia. The accuracy of SRK/T formula is similar to that of Haigis formula. Another factor affecting the prediction error in IOL calculations was the error of AL measuring., In this study, the accuracy of each formula under different ALs was analyzed. This study showed that the prediction error of SRK/T formula and Barrett Universal II formula was less when the AL was between 24.5 and 30 mm in comparison to that calculated by Haigis, Holladay, and Hoffer Q; the proportion of Barrett Universal II formula was higher than that of SRK/T formula when the refractive error absolute value was less than 0.5D; and Barrett Universal II formula was lower than SRK/T formula when the refractive error absolute value was more than 0.5D. These results showed that Barrett Universal II formula had the highest refractive prediction accuracy for patients with AL between 24.5 and 30 mm. Meanwhile, we found that when the AL was greater than 30 mm, the prediction error of Haigis formula and Barrett Universal II formula was less. 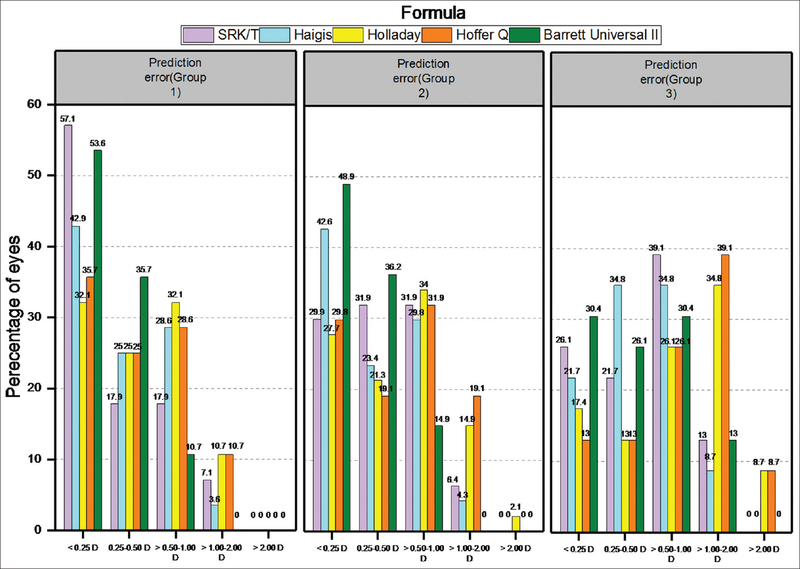 However, the accuracy analysis shows that the prediction error of each formula was high. We observed that the proportion of Barrett Universal II formula was higher than Haigis formula when the refractive error absolute value was less than 0.5D, and that Barrett Universal II formula was lower than Holladay, Hoffer Q, and SRK/T when the refractive error absolute value was more than 0.5 D. This result suggests that with the increase in AL, the formula of refractive prediction accuracy in patients with high myopia went down, but Barrett Universal II formula still had a certain advantage. 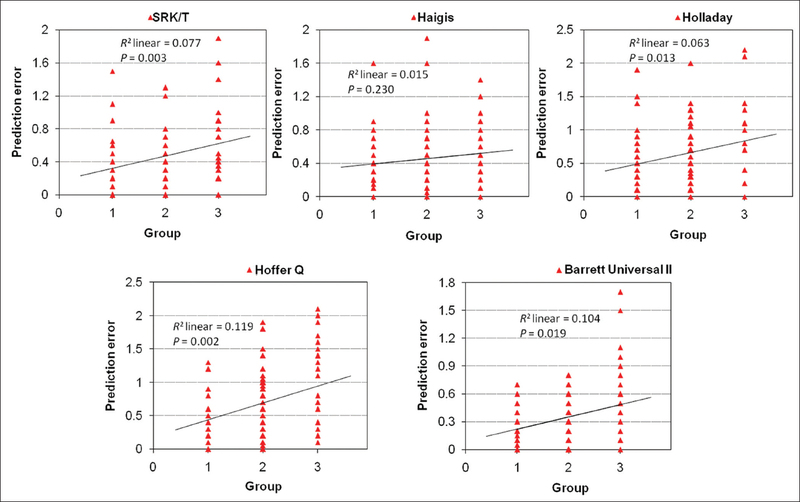 Therefore, we believe that Barrett Universal II formula has higher diopter prediction accuracy in patients with high myopia, especially for patients with longer AL have higher application value. Statistical analysis showed that the refractive error absolute value of SRK/T, Holladay, Hoffer Q formulas, and the Barrett Universal II formula was positively correlated with AL. That is, the longer the length of the AL of the patient's eye, the greater the refractive error absolute value. Therefore, in clinical treatment, we can measure the length of the AL of the patient's eye preoperatively by appropriate prediction formula to reduce the refractive error absolute value and improve the clinical treatment effect of patients with high myopia. A limitation of this study was that we did not fully consider the IOL differences among patients, and that there were some differences in terms of the strength of the crystalline lens of different patients. Another limitation was that each formula had its own applicability. All IOL power calculations in this study were based on the measurements from LENSTAR LS900; however, Barrett Universal II formula was based on the measurements from another source. As zero-diopter IOL and minus-power IOL only affect a small number of the population. Thus, the number of research subjects with the two diseases recruited was small, which may hinder the accuracy of the prediction result calculated by each formula. Also, patients with ALs that were greater than 26 mm were relatively rare, and the sample cross section of patients being monitored was insufficient to give a conclusive result. In conclusion, the results of this study suggested that Barrett Universal II formula achieves the highest accuracy for predicting diopter after surgery for high myopia. SRK/T and Haigis formulas achieved similar results that were more accurate than those calculated by Holladay and Hoffer Q formulas. In addition, Barrett Universal II formula had the highest value of refractive prediction for patients with high myopia with long AL. Thus, Barrett Universal II formula may be more applicable for patients with high myopia. Dong Zhou and Zhuo Sun contributed equally to this work. This work was supported by Clinical Application and Evaluation of VERION Digital Navigation System in Refractive Cataract Surgery [Grant Number: CE20175039]. Wang XG, Dong J, Pu YL, Liu HJ, Wu Q. Comparison axial length measurements from three biometric instruments in high myopia. Int J Ophthalmol 2016;9:876-80. Jong M, Sankaridurg P, Li W, Resnikoff S, Naidoo K, He M. Reduced vision in highly myopic eyes without ocular pathology: The ZOC-BHVI high myopia study. Clin Exp Optometry 2017;101. Yan J, Hu DN, Jing S, Zhou J. Correlations between MMPs and TIMPs levels in aqueous humor from high myopia and cataract patients. Curr Eye Res 2017;42:600-3. Asonuma S, Hirota M, Kanda H, Haga H, Ikuno Y, Matsumoto T, et al. Quality of life of high myopia and influence of cataract surgery. Folia Japonica Ophthalmol Clin 2017;10:373-9. Chen X, Yu Y, Song X, Zhu Y, Wang W, Yao K. Clinical outcomes of femtosecond laser-assisted cataract surgery versus conventional phacoemulsification surgery for hard nuclear cataracts. J Cataract Refract Surg 2017;43:486-91. Czajka MP, Frajdenberg A, Johansson B. Comparison of 1.8-mm incision versus 2.75-mm incision cataract surgery in combined phacoemulsification and 23-gauge vitrectomy. Acta Ophthalmologica. 2016;94:507-13. Ewe SY, Abell RG, Oakley CL, Lim CH, Allen PL, McPherson ZE, et al. A comparative cohort study of visual outcomes in femtosecond laser-assisted versus phacoemulsification cataract surgery. Ophthalmology 2016;123:178-82. Senthil S, Chinta S, Rao HL, Choudhari NS, Pathak-Ray V, Mandal AK, et al. Comparison of cataract surgery alone versus cataract surgery combined with trabeculectomy in the management of phacomorphic glaucoma. J Glaucoma 2016;25. Abulafia A, Hill WE, Koch DD, Wang L, Barrett GD. Accuracy of the Barrett True-K formula for intraocular lens power prediction after laser in situ keratomileusis or photorefractive keratectomy for myopia. J Cataract Refract Surg 2016;42:363-9. Kang SI, Moon K, Jun JH. Accuracy of three intraocular lens-power formulas in predicting refractive outcomes in different intraocular lenses. J Korean Ophthalmol Soc 2016;57:1891. Mimouni M, Shapira Y, Jadon J, Frenkel S, Blumenthal EZ. Assessing visual function behind cataract: Preoperative predictive value of the Heine Lambda 100 retinometer. Eur J Ophthalmol 2017;27:559. Lenkova GA. Specific features of measuring the optical power of artificial refractive and diffractive–refractive eye lenses. Opt Spectrosc 2016;121:310-21. Zhang Y, Liang XY, Liu S, Lee JWY, Bhaskar S, Lam DSC. Accuracy of intraocular lens power calculation formulas for highly myopic eyes. J Ophthalmol 2016;2016:1-7. Cooke DL, Cooke TL. Comparison of 9 intraocular lens power calculation formulas. J Cataract Refract Surg 2016;42:1157-64. Vasavada V, Shah SK, Vasavada VA, Vasavada AR, Trivedi RH, Srivastava S, et al. Comparison of IOL power calculation formulae for pediatric eyes. Eye 2016;30:1242. Doshi D, Limdi P, Parekh N, Gohil N. A comparative study to assess the predictability of different IOL power calculation formulas in eyes of short and long axial length. J Clin Diagn Res 2017;11:NC01. Roberts TV, Hodge C, Sutton G, Lawless M. Comparison of Hill-RBF, Barrett Universal and current third generation formulas for the calculation of intraocular lens power during cataract surgery. Clin Exp Ophthalmol 2017;143:159-67. Ghoreyshi M, Khalilian A, Peyman M, Mohammadinia M, Peyman A. Comparison of OKULIX ray-tracing software with SRK-T and Hoffer-Q formula in intraocular lens power calculation. J Curr Ophthalmol 2018;30:63-7. Seo S, Lee CE, Kim YK, Lee SY, Jeoung JW, Park KH. Factors affecting refractive outcome after cataract surgery in primary angle-closure glaucoma. Clin Exp Ophthalmol 2016;44:693-700. Liu X, Fan F, Wang X, Lu Y, Zheng T, Zhou P, et al. Long-term observation of triplex surgery for cataract after phakic 6h implantation for super high myopia. J Ophthalmol 2016;2016:1-10. Wu Y, Liu S, Liao R. Prediction accuracy of intraocular lens power calculation methods after laser refractive surgery. BMC Ophthalmol 2017;17:44. Chen X, Yuan F, Wu L. Metaanalysis of intraocular lens power calculation after laser refractive surgery in myopic eyes. J Cataract Refract Surg 2016;42:163-70. Reitblat O, Levy A, Kleinmann G, Lerman TT, Assia EI. Intraocular lens power calculation for eyes with high and low average keratometry readings: Comparison between various formulas. J Cataract Refract Surg 2017;43:1149. Savini G, Hoffer KJ, Lombardo M, Serrao S, Schiano-Lomoriello D, Ducoli P. Influence of the effective lens position, as predicted by axial length and keratometry, on the near add power of multifocal intraocular lenses. J Cataract Refract Surg 2016;42:44. Mckee HD, Jhanji V. Theoretical effect of lens position and corneal curvature on the near focal point of multifocal intraocular lenses. J Refract Surg 2016;32:64. Raucau M, El HC, Agard E, Lagenaite C, Dot C. Toric lens implantation in cataract surgery: Automated versus manual horizontal axis marking, analysis of 50 cases. J Fr Ophtalmol 2018;41. Vlachynska A, Oplatkova ZK, Sramka M, editors. The coordinate system of the eye in cataract surgery: Performance comparison of the circle Hough transform and Daugman; s algorithm. American Institute of Physics Conference Series; 2017. Jiménez-Alfaro I, Gómez-Tellería G, Bueno JL, Puy P. Contrast sensitivity after posterior chamber phakic intraocular lens implantation for high myopia. J Refract Surg 2016;17:641. Kane JX, Van HA, Atik A, Petsoglou C. Accuracy of 3 new methods for intraocular lens power selection. J Cataract Refract Surg 2017;43:333.